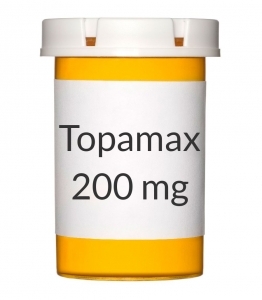 USES: Topiramate is used alone or with other medications to prevent and control seizures (epilepsy). This medication is also used to prevent migraine headaches and decrease how often you get them. Topiramate will not treat a migraine headache once it occurs. If you get a migraine headache, treat it as directed by your doctor (such as by taking pain medication, lying down in a dark room). Topiramate is known as an anticonvulsant or antiepileptic drug. HOW TO USE: Read the Medication Guide and, if available, the Patient Information Leaflet provided by your pharmacist before you start taking topiramate and each time you get a refill. If you have any questions, ask your doctor or pharmacist. Take this medication by mouth with or without food as directed by your doctor, usually twice daily. Swallow the tablets whole since breaking them may leave a bitter taste. To prevent kidney stones from forming, drink plenty of liquids while taking this medication unless your doctor instructs you otherwise. Dosage is based on your medical condition and response to treatment. For children, the dosage is also based on weight. Your doctor will gradually increase your dose to reduce your risk of side effects. For some conditions, you may start treatment with topiramate once daily at bedtime and slowly increase your dose to twice a day. It may take several weeks or months to reach the best dose for you and to get the full benefit from this medication. Take this medication regularly to get the most benefit from it. To help you remember, take it at the same times each day. Do not stop taking this medication without consulting your doctor. Some conditions may become worse when this drug is suddenly stopped. Your dose may need to be gradually decreased. Tell your doctor if your condition persists or if it worsens. SIDE EFFECTS: Tiredness, drowsiness, dizziness, loss of coordination, tingling of the hands/feet, loss of appetite, bad taste in your mouth, diarrhea, and weight loss may occur. Mental problems such as confusion, slowed thinking, trouble concentrating or paying attention, nervousness, memory problems, or speech/language problems may also occur. If any of these effects persist or worsen, tell your doctor or pharmacist promptly. Remember that your doctor has prescribed this medication because he or she has judged that the benefit to you is greater than the risk of side effects. Many people using this medication do not have serious side effects. Tell your doctor right away if any of these unlikely but serious side effects occur: signs of kidney stones (such as severe back/side/abdominal/groin pain, fever, chills, painful/frequent urination, bloody/pink urine). A small number of people who take anticonvulsants for any condition (such as seizures, bipolar disorder, pain) may experience depression, suicidal thoughts/attempts, or other mental/mood problems. Tell your doctor right away if you or your family/caregiver notice any unusual/sudden changes in your mood, thoughts, or behavior including signs of depression, suicidal thoughts/attempts, thoughts about harming yourself. Tell your doctor right away if any of these rare but serious side effects occur: rapid breathing, fast/slow/irregular heartbeat, bone pain, broken bones, loss of consciousness. Rarely, topiramate may cause a very serious eye problem, generally within 1 month of starting treatment. If untreated, this eye problem can lead to permanent blindness. Therefore, get medical help right away if any of these side effects occur: sudden vision changes (such as decreased vision, blurred vision), eye pain/redness. This medication can rarely cause a serious metabolic problem (high amount of ammonia in the blood), especially if you are also taking valproic acid. Tell your doctor right away if you experience sudden/unexplained tiredness, vomiting, or mental changes (such as decreased alertness). A very serious allergic reaction to this drug is rare. However, get medical help right away if you notice any symptoms of a serious allergic reaction, including: rash, itching/swelling (especially of the face/tongue/throat), severe dizziness, trouble breathing. This is not a complete list of possible side effects. If you notice other effects not listed above, contact your doctor or pharmacist. In the US - Call your doctor for medical advice about side effects. You may report side effects to FDA at 1-800-FDA-1088. In Canada - Call your doctor for medical advice about side effects. You may report side effects to Health Canada at 1-866-234-2345. PRECAUTIONS: Before taking topiramate, tell your doctor or pharmacist if you are allergic to it; or if you have any other allergies. This product may contain inactive ingredients, which can cause allergic reactions or other problems. Talk to your pharmacist for more details. Before using this medication, tell your doctor or pharmacist your medical history, especially of: a certain eye problem (narrow angle glaucoma), kidney problems (such as kidney stones), liver problems, mental/mood problems (such as depression, thoughts of suicide), lung/breathing problems, a certain metabolic imbalance (metabolic acidosis), long-term diarrhea, a diet high in fat and low in carbohydrates (ketogenic diet), brittle bones (osteoporosis). This drug may make you dizzy or drowsy or impair your judgment. Do not drive, use machinery, or do any activity that requires alertness until you are sure you can perform such activities safely. Avoid alcoholic beverages. Topiramate can infrequently cause decreased sweating, which could raise your body temperature to unsafe levels (hyperthermia). The risk of this serious side effect is greater in hot weather and/or during vigorous exercise, especially in children. Drink plenty of fluids and dress lightly in hot weather or when exercising. Check carefully for signs of decreased sweating. If this occurs, immediately stop exercising and seek cooler shelter. Get medical help right away if you develop a fever, mental/mood changes, headache, or dizziness. Before having surgery, tell your doctor or dentist about all the products you use (including prescription drugs, nonprescription drugs, and herbal products). Children may be more sensitive to the side effects of this drug, especially weakened bones, slowed growth rate, and decreased sweating. Consult your doctor or pharmacist for more details. During pregnancy, this medication should be used only when clearly needed. It may harm an unborn baby. Discuss the use of reliable forms of birth control with your doctor (see also Drug Interactions section). If you are planning pregnancy, become pregnant, or think you may be pregnant, immediately talk to your doctor about the benefits and risks of using this medication during pregnancy. If you are taking this drug to treat seizures, note that untreated seizures are a serious condition that can harm both a pregnant woman and her unborn baby, so do not stop taking this medication unless directed by your doctor. This medication passes into breast milk and may have undesirable effects on a nursing infant. Consult your doctor before breast-feeding. DRUG INTERACTIONS: Drug interactions may change how your medications work or increase your risk for serious side effects. This document does not contain all possible drug interactions. Keep a list of all the products you use (including prescription/nonprescription drugs and herbal products) and share it with your doctor and pharmacist. Do not start, stop, or change the dosage of any medicines without your doctor's approval. Some products that may interact with this drug include: carbonic anhydrase inhibitors (such as acetazolamide, methazolamide), valproic acid, other drugs that cause decreased sweating (including anticholinergics such as belladonna alkaloids/scopolamine, antihistamines such as hydroxyzine, phenothiazines such as chlorpromazine). This medication may decrease the effectiveness of hormonal birth control products (such as pills, patch, ring). This effect can result in pregnancy. Ask your doctor or pharmacist for details. Discuss whether you should use additional reliable birth control methods while using this medication. Also tell your doctor if you have any new spotting or breakthrough bleeding, because these may be signs that your birth control is not working well. Tell your doctor or pharmacist if you are taking other products that cause drowsiness including alcohol, antihistamines (such as cetirizine, diphenhydramine), drugs for sleep or anxiety (such as alprazolam, diazepam, zolpidem), muscle relaxants, and narcotic pain relievers (such as codeine). Check the labels on all your medicines (such as allergy or cough-and-cold products) because they may contain ingredients that cause drowsiness. Ask your pharmacist about using those products safely. OVERDOSE: If overdose is suspected, contact a poison control center or emergency room immediately. US residents can call the US National Poison Hotline at 1-800-222-1222. Canada residents can call a provincial poison control center. Symptoms of overdose may include: severe drowsiness, loss of consciousness. NOTES: Do not share this medication with others. Laboratory and/or medical tests (such as eye exams, bicarbonate blood level) should be performed to monitor your progress and check for side effects. MISSED DOSE: If you miss a dose, take it as soon as you remember. If it is within 6 hours of your next dose, skip the missed dose and resume your usual dosing schedule. Do not double the dose to catch up. If you miss more than one dose, call your doctor for advice. STORAGE: Store in a tightly closed container at room temperature away from light and moisture. Do not store in the bathroom. Keep all medications away from children and pets. Do not flush medications down the toilet or pour them into a drain unless instructed to do so. Properly discard this product when it is expired or no longer needed. Consult your pharmacist or local waste disposal company. MEDICAL ALERT: Your condition can cause complications in a medical emergency. For enrollment information call MedicAlert at 1-800-854-1166 (US) or 1-800-668-1507 (Canada). Information last revised March 2011. Copyright(c) 2011 First Databank, Inc.